Each member of Theta-7 Acquisitus was hand-picked by Balphamus Vaulk for their combat expertise and rigorous stealth-engagement protocols. Together, they embark upon numerous secretive actions at the behest of their calculating master. Sometimes these missions are part of a sanctioned Imperial offensive, in which Theta-7 plays a small but decisive role, but often they kill only to further Vaulk’s own ends. 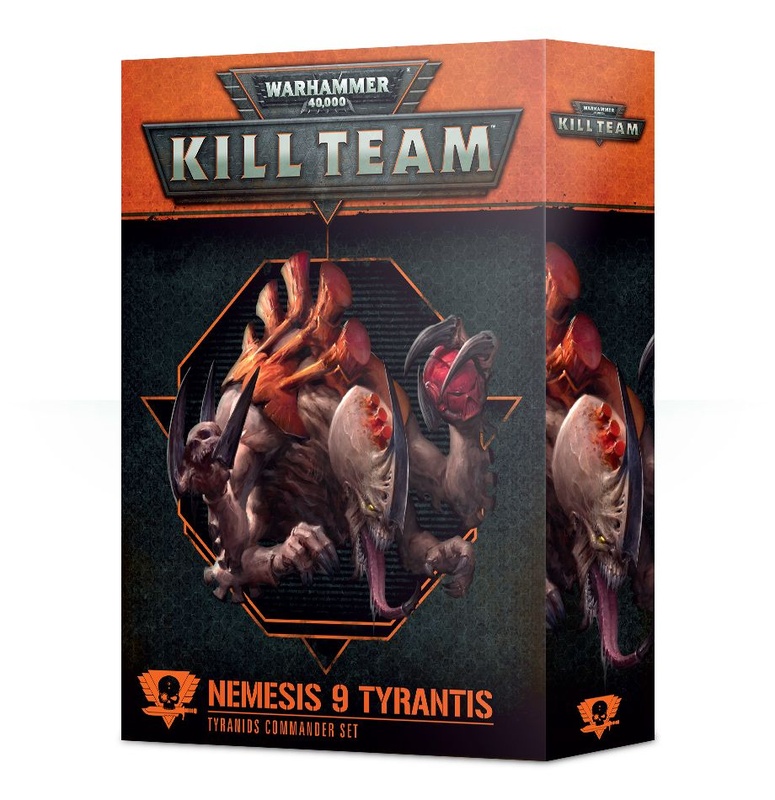 Regardless of the nature of their task, the warriors of Theta-7 Acquisitus engage the enemy with furious fervour, eliminating their foes in the name of the Blessed Omnissiah.An expansion for Warhammer 40,000: Kill Team, this box includes 6 miniatures – one of which is an exclusive Commander, the Tech-Priest Manipulus – a scenery set, a background booklet, as well as brand-new Tactics and Mission cards. Included:- 8-page Theta-7 Acquisitus booklet- 17 Adeptus Mechanicus Tactics cards- 5 Adeptus Mechanicus Commander Tactics cards- 4 Mission cards- 2 Adeptus Mechanicus Kill Team tokens sheets- 6 Adeptus Mechanicus datacards- A Balphamus Vaulk Tech-Priest Manipulus ability tree card that presents a new Adeptus Mechanicus Tech-Priest specialism that can only be used by Balphamus Vaulk.- 1 multipart plastic Tech-Priest Manipulus (exclusive to this set), armed with magnarail lance, omnissian staff and mechadendrites, supplied in pre-coloured red plastic- 5 multipart plastic Adeptus Mechanicus Sicarian Infiltrators armed either with stubcarbine and power sword, or taser goad and flechette blaster. They can be built instead as Sicarian Ruststalkers, depending on your preference, carrying either paired transonic blades, or a combination of chordclaw and transonic razor. All miniatures are supplied on red-coloured plastic.- 1 set of Ryza-pattern RuinsAlso included in this box are rules for using all of these miniatures in your games of Warhammer 40,000. Ghyrson Starn is a hero of the xenos-tainted cultists who infest the war-torn world of Vigilus, a symbol of resistance against the tyrannical Imperium. To his enemies he is an anarchist and a cold-blooded killer, an assassin who steps from the shadows to slaughter his foes with blasts from his custom autostub pistols. He leads the kill team known as Starn’s Disciples, each of whom would gladly sacrifice their life for the gunslinging hero they idolise. 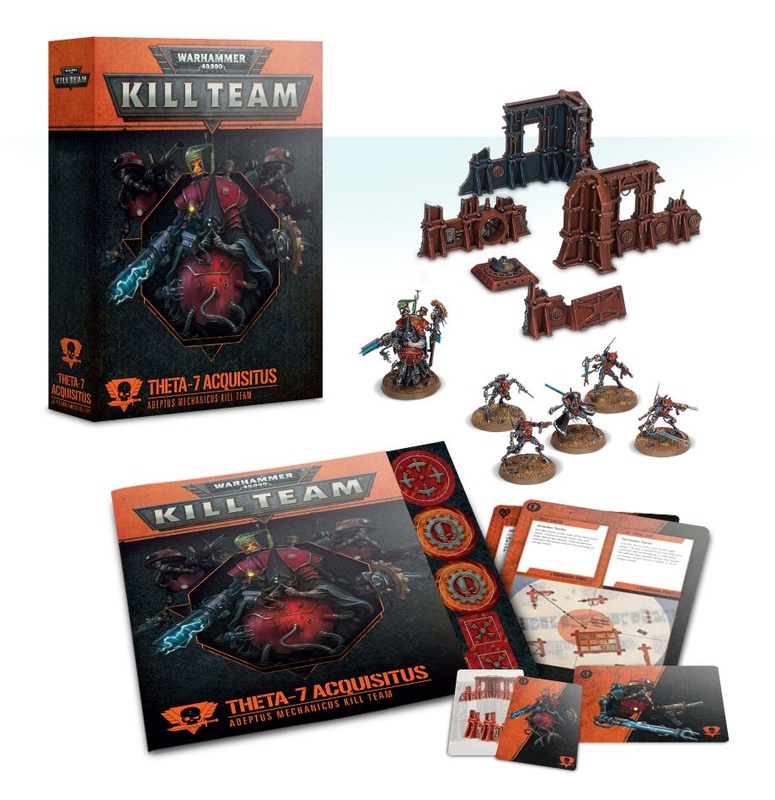 This band of killers has murdered planetary governors, sabotaged Imperial monuments and stolen munitions from Astra Militarum outposts, building their infamous legend with every fresh outrage.An expansion for Warhammer 40,000: Kill Team, this box includes 6 miniatures – one of which is an exclusive Commander, a Kelermorph – a scenery set, a background booklet, as well as brand-new Tactics and Mission cards. Included:- 8-page Starn's Disciples booklet- 18 Genestealer Cults Tactics cards- 6 Genestealer Cults Commander Tactics cards- 4 Mission cards 4 Psychic Power cards- 2 Genestealer Cults Kill Team tokens sheets- 6 Genestealer Cults datacards- A Ghyrson Starn ability tree card that presents a new Genestealer Cults Kelermorph specialism that can only be used by Ghyrson Starn- 1 multipart plastic Kelermorph (exclusive to this set), armed with 3 liberator autostubs and a cultist knife, supplied in pre-coloured light grey plastic- 5 plastic Genestealer Cults Hybrid Metamorphs that can be armed with any of a huge variety of Meptamorph mutations. They can be built instead as Acolyte Hybrids that can be armed with any of a huge variety of knives, explosives, claws, hand flamers and heavy mining equipment. All miniatures are supplied in re-coloured light grey plastic.- 1 set of Ryza-pattern Ruins.Also included in this box are rules for using all of these miniatures in your games of Warhammer 40,000. At the farthest reaches of space, the boundaries of the Imperium change almost daily as new worlds are discovered and settled and others fall to predations of aliens or rogue factions seeking freedom from of the crushing yoke of Imperial oppression. Open hostility is a common occurrence on such lawless worlds, yet with fewer resources to call upon, many such conflicts are resolved as guerrilla or shadow wars.The Sector Fronteris Killzone Environment is an expansion for Kill Team – in the packed box, you'll find a gameboard, scenery, and exclusive rules that use the unique nature of the Sector Fronteris terrain to introduce dangerous new missions and powerful effects to your games. Included: - A double-sided Kill Team gameboard measuring 22” x 30”, printed on heavy, durable card stock. One side depicts a sand-blasted wilderness, while the other represents a more industrialised border region- An 8-page booklet describing the sorts of wild frontier worlds that loosely make up the borders of Imperial territory, and where the influence of Terra is seldom felt. - 12 Sector Fronteris Tactics cards – these can be used by any Kill Team Faction, with 4 cards providing interactions with the Sector Fronteris scenery and 5 being used specifically by Scout, Comms, Sniper or Medic Specialists- A Sector Fronteris Environment card, which provides 6 different rules that interact with the scenery- 4 Sector Fronteris Mission cards – designed to be used in conjunction with the gameboard and scenery, this is a set of 2 matched play missions and 2 narrative play missions, which are split between attacker and defender- 4 Ryza-pattern Ruins plastic frames – including two brand sets of frames that include 2 slot-together walls, raised barricade, 3 armoured window covers, 1 large section of flooring, 3 small sections of ruined floor, and one connector that resembles a light. If you combine these 2 new frames, you can build a complete STC Ryza-Pattern building with a roof. There are also 2 plastic frames of STC Ryza-Pattern Ruins, each containing 3 slot-together walls, 3 ruined wall sections, and an Inquisitorial crate. 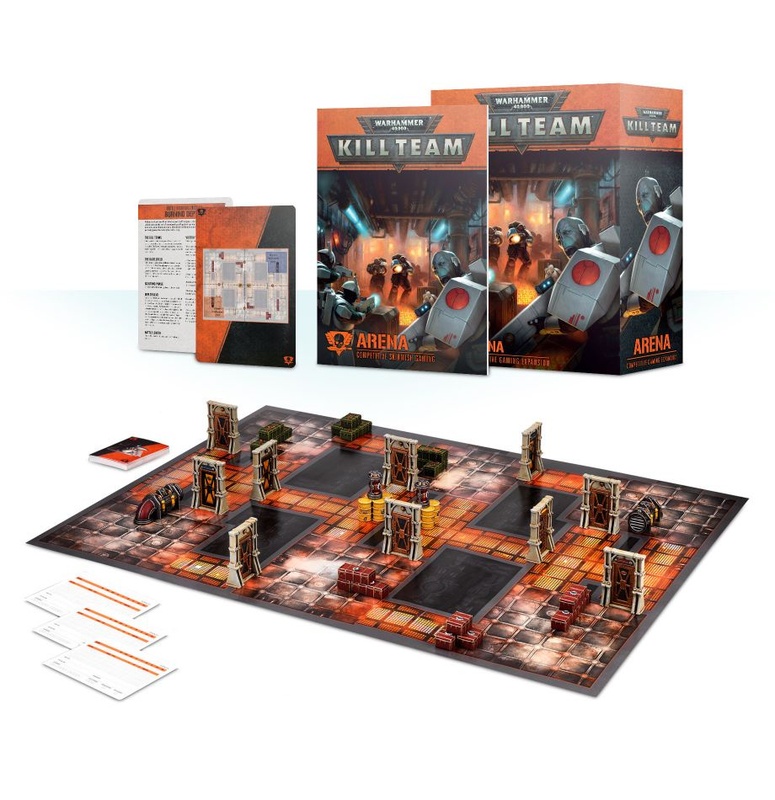 Kill Team: Arena is an expansion for Warhammer 40,000: Kill Team that introduces rules for competitive play, using evenly balanced terrain set-ups and mission objectives to offer each player an even playing field. Also included are missions and rules for running competitive Kill Team tournaments, either for single players or teams of two allies (known as Battle Brothers).The BookA 64-page softback book, Kill Team: Arena explains everything you need to know about playing competitive games of Kill Team, from one-off games to various formats of tournament play:Killzones: This sections describes rules for Ultra-close Confines combat and introduces four new Killzone Environments (Generatorium, Catacombs, Armorium Stockpile, and Garrison Vault), each with their own environmental rules.Competitive Play: This section includes competitive rules, terrain maps and missions intended for use in games where balance is paramount, such as those played in tournaments.Battle Brothers: Introduces a cooperative format for playing team-based competitive play games of Kill Team, where each Battle Brothers team consists of two players whose kill teams are pitted against their opponents' to see who can complete the most objectives. 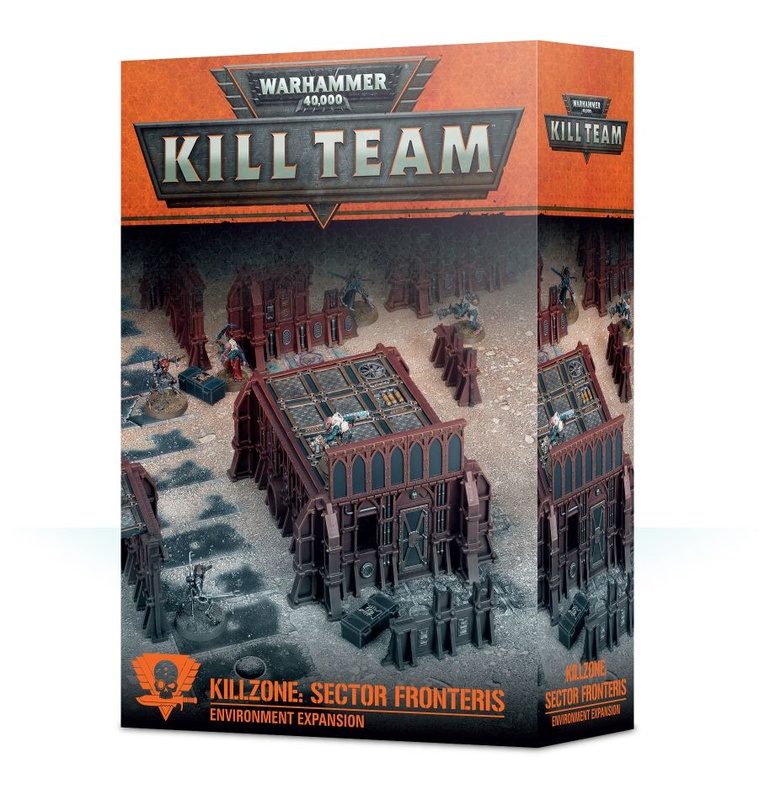 Includes 4 Battle Brothers missions and 28 Battle Brothers Tactics.Ultima Missions: This section describes how to create custom competitive missions using the Killzones found in Kill Team: Arena by utilising randomly generated killzones, deployment maps and Arena Objectives. This ensures no two competitive play games are exactly alike!Kill Team Tournaments: Guidelines for running and participating in competitive play Kill Team tournaments, including how to register players and command rosters, determining player pairings in each round of a tournament, as well as how to score and rank players.Using Competitive Play Missions in Campaigns: Guidance on how to use the missions from this set in your campaign games.ExtrasAlong with the comprehensive book of rules, there is included a set of cards, tokens, scenery and gameboards for use with Arena:- 28 Battle Brothers Tactics cards- 12 mission cards, including Battle Brothers missions and 8 Competitive Play missions- 2 sets of 12 Arena Objective cards (one for each player). 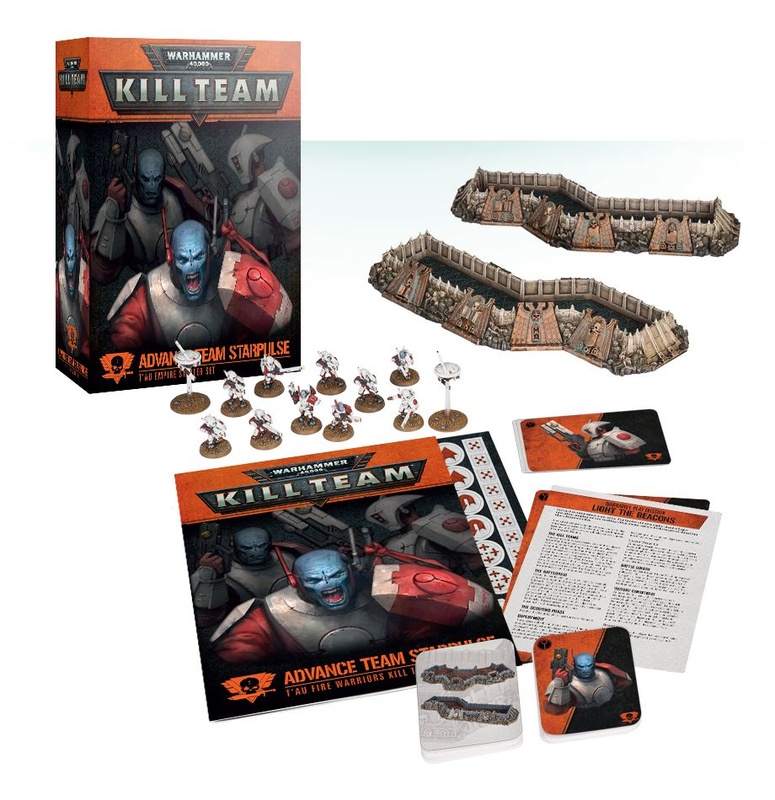 Each deck is also supplied with a storage sleeve to ensure they are not mixed up.- 2 x 22x30” double-sided, folding card gameboards- 2 plastic frames of scenery, each containing the following: 5 doors, 4 barrels, 10 crates, 1 pipe, and 1 cylindrical container.A copy of the Kill Team Core Manual is required to use this set. The bioform codified by the Inquisition as Nemesis 9 Tyrantis is a true horror. It prizes terror so highly it likes to leave one prey-creature from each group of victims alive so they might spread their fear to the common herd of Vigilus like a virus. Nemesis 9 Tyrantis has on more than one occasion been mistaken for the leader of the planet’s Genestealer Cult infestation – however, so long as the Broodlord gets to feed on the minds and bodies of the populace, it cares little for the chatterings of ambulatory biomass.Add a Commander – a powerful hero character with unique abilities and rules – to your Tyranid kill team with this set. It contains a multipart plastic Broodlord miniature, a set of cards packed with exclusive rules and a sheet of tokens for use in-game:- A Broodlord: this multipart plastic kit is used to represent Nemesis 9 Tyrantis – or the Commander of any Tyranid kill team you wish – standing atop a chitinous structure, poised ready to strike with his truly horrifying monstrous rending claws, his maw open and showing off rows of sharp fangs- A datacard for Nemesis 9 Tyrantis, featuring its characteristics, weapons, abilities and specialisms, along with a card featuring his background- A card featuring Nemesis 9 Tyrantis’ skill tree – Broodlord specialisms which can only be used by that character- 3 Hive Mind Discipline psychic power cards- 3 Tyranid Commander Tactics Cards, including 2 Tactics exclusive to this set- A sheet of tokens for use in games of Kill Team – this includes 1 Move/Charge token, 1 Fall Back/Advance token, 1 Ready/Shoot token, 6 Tactic/psychic power tokens, 3 wound tokens, and 3 objective tokens. Crasker Matterzhek of the Elevated Siblings bears the standard of his kindred, a sacred duty given to him by Primus Desh. The icon of Grandsire Wurm must be seen from the highest vantage point, to boost the rebellion’s morale in this vital hour – with the cult’s most experienced kill team alongside him, Crasker feels sure he will make it to the very tip of the sprawl’s tallest spire. Perhaps he will raise it so high that the Star Children will see him, and grant him the desire he so fervently desires...Add a Commander – a powerful hero character with unique abilities and rules – to your Genestealer Cults kill team with this set. It contains a multipart plastic Acolyte Iconward miniature, a set of cards packed with exclusive rules and a sheet of tokens for use in-game:- An Acolyte Iconward: this multipart plastic kit is used to represent Crasker Matterzhek – or the Commander of any Genestealer Cults kill team you wish – armed with an autopistol, blasting charges and rending claws the Iconward clutches his cult’s sacred banner hoisting it aloft to inspire his broodkin to surge forward in a wave of indiscriminate violence- A datacard for Crasker Matterzhek, featuring his characteristics, weapons, abilities and specialisms, along with a card featuring his background- A card featuring Crasker Matterzhek’s skill tree – Acolyte Iconward specialisms which can only be used by that character- 4 Broodmind discipline psychic power cards- 5 Genestealer Cults Commander Tactics Cards, including 2 Tactics exclusive to this set- A sheet of tokens for use in games of Kill Team – this includes 1 Move/Charge token, 1 Fall Back/Advance token, 1 Ready/Shoot token, 6 Tactic/psychic power tokens, 3 wound tokens, and 3 objective tokens. 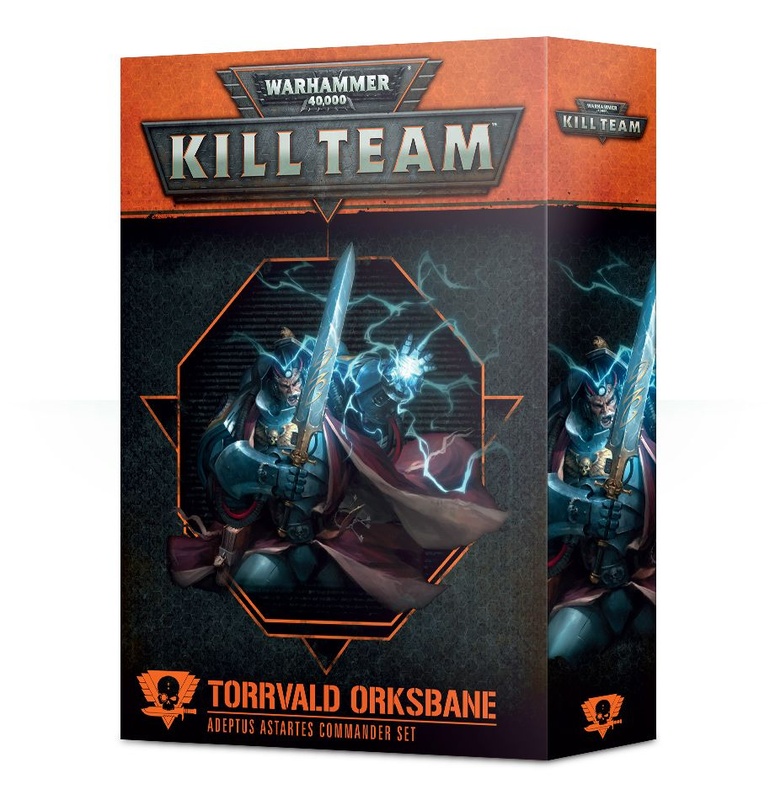 Torrvald Orksbane is a psyker of impressive power, able to conjure blizzards of destructive energy from the air and send bolts of freezing cold crackling from his fingertips. He has a knack for hunting Orks, saying he can ‘see’ their raw aggression on the wind – as a Space Wolf his every sense is sharpened, and as a Librarian, that includes those beyond mortal capabilities. When the force fields that protected Megaborealis went down, Torrvald lived up to his name, seeking out the Reivers known as the Fangs of Ulfrich before taking the fight to the Orks in the borer-hives.Add a Commander – a powerful hero character with unique abilities and rules – to your Adeptus Astartes kill team with this set. It contains a multipart plastic Primaris Librarian miniature, a set of cards packed with exclusive rules and a sheet of tokens for use in-game:- A Primaris Librarian: this multipart plastic kit is used to represent Torrvald Orksbane – or the Commander of any Adeptus Astartes kill team you wish – clad in Mk X power armour, with many elaborate accoutrements, from his ornate multi-layered cloak to the detailed wiring of his psychic hood, armed with a force sword in his right hand and a holstered bolt pistol- A datacard for Torrvald Orksbane, featuring his characteristics, weapons, abilities and specialisms, along with a card featuring his background- A card featuring Torrvald Orksbane’s skill tree – Primaris Librarian specialisms which can only be used by that character- 4 Librarius Discipline psychic power cards, including the exclusive Stormcaller psychic power- 5 Adeptus Astartes Commander Tactics Cards, including 2 Tactics exclusive to this set- A sheet of tokens for use in games of Kill Team – this includes 1 Move/Charge token, 1 Fall Back/Advance token, 1 Ready/Shoot token, 6 Tactic/psychic power tokens, 3 wound tokens, and 3 objective tokens. Always watching, always studying, Magus Dalathrust is an unblinking spider in the tangled webs of Megaborealis. It is his desire to unlock the secrets of the alien technology that lies beneath Vigilus’ skin. 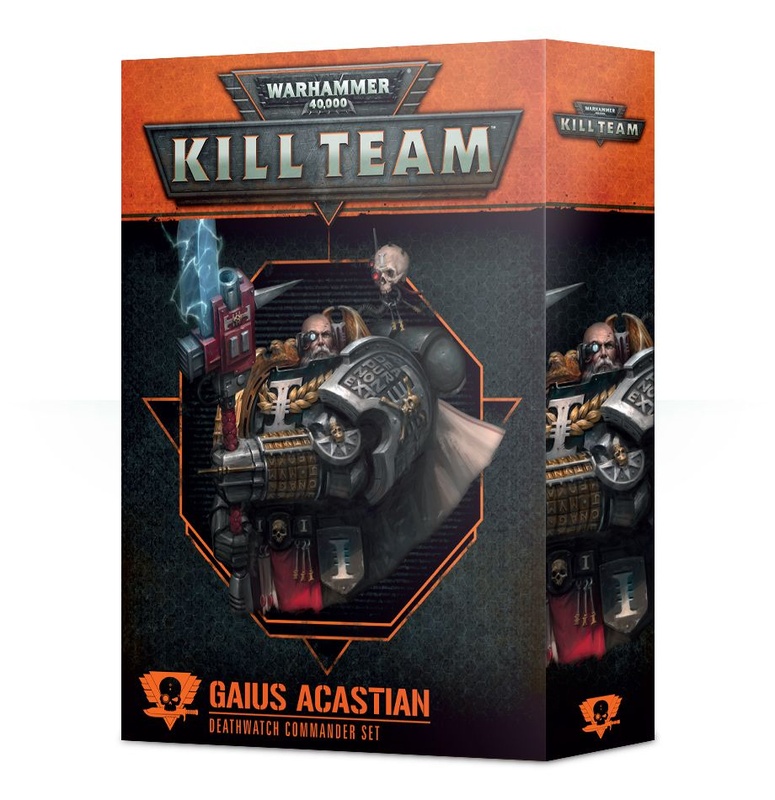 He has determined that the Skitarii kill team known as Gamma-Zhul 881 are the most likely of their kind to survive fierce resistance, and he has commandeered them as a bodyguard as he peels back the layers of mystery that shroud the planet – killing anyone that stands in his way.Add a Commander – a powerful hero character with unique abilities and rules – to your Adeptus Mechanicus kill team with this set. 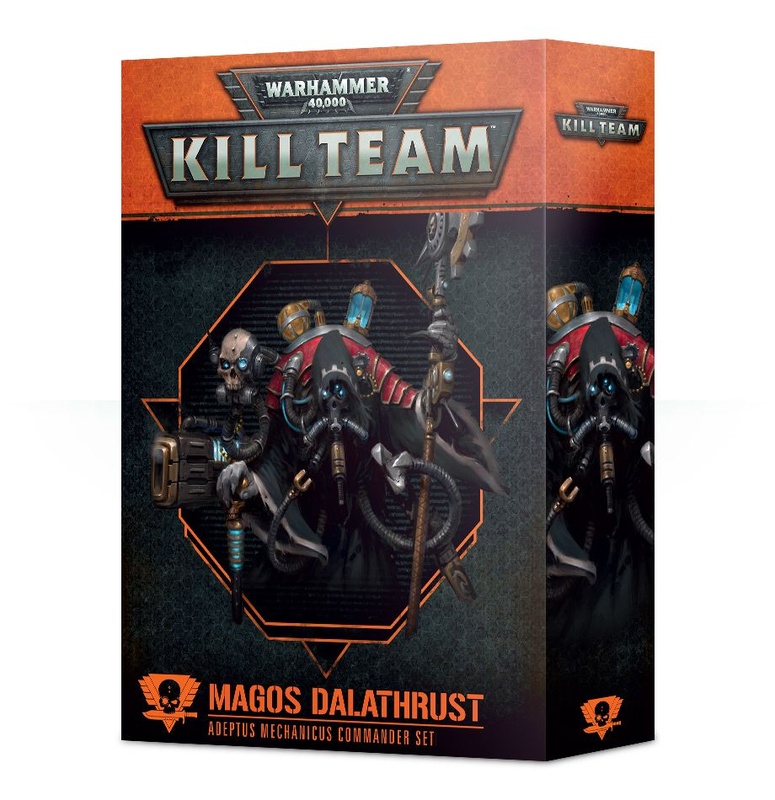 It contains a multipart plastic Tech-Priest Dominus miniature, a set of cards packed with exclusive rules and a sheet of tokens for use in-game:- A Tech-Priest Dominus: this multipart plastic kit is used to represent Magos Dalathrust – or the Commander of any Adeptus Mechanicus Kill Team you wish – a Tech-Priest augmented to the point of being almost entirely cybernetic, scuttling on several insectile legs which poke out from beneath a tattered robe; this only adds to the sinister air provided by his choices of armament with a volkite blaster, a macrostubber, an eradication ray, a phosphor serpenta and a power axe – his badge of office – and detailed with a microphone and loudspeaker- A datacard for Magos Dalathrust, featuring his characteristics, weapons, abilities and specialisms, along with a card featuring his background- A card featuring Magos Dalathrust’s skill tree – Tech-Priest Dominus specialisms which can only be used by that character- 4 Adeptus Mechanicus Commander Tactics cards, including 2 Tactics exclusive to this set- A sheet of tokens for use in games of Kill Team – this includes 1 Move/Charge token, 1 Fall Back/Advance token, 1 Ready/Shoot token, 6 Tactic/psychic power tokens, 3 wound tokens, and 3 objective tokens. Vysa Kharavyxis was once a favoured champion of the Crucibael, bestowed the rank of Succubus by Lelith Hesperax herself. Gored to death by a tentacled Mortipod in the contests of the Wych Cult of Strife, then resurrected by her flesh-surgeon accomplices, Vysa hunts new beasts and warriors for the arena, refining her duelling technique against them before they can reach the Dark City – and the show begins for real.Add a Commander – a powerful hero character with unique abilities and rules – to your Drukhari kill team with this set. 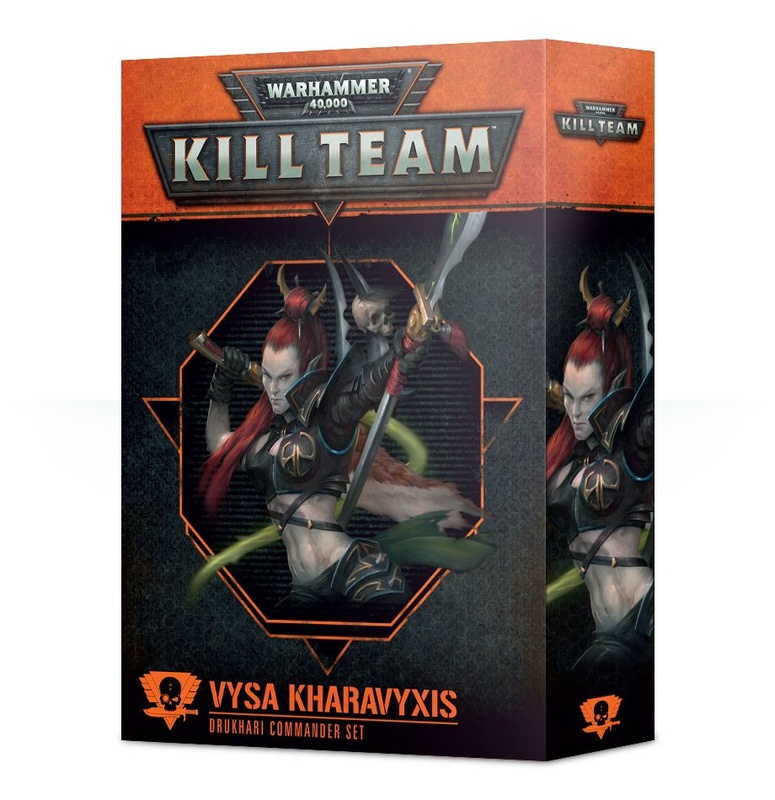 It contains a multipart plastic Succubus miniature, a set of cards packed with exclusive rules and a sheet of tokens for use in-game:- A Succubus: this multipart plastic kit is used to represent Vysa Kharavyxis – or the Commander of any Drukhari kill team you wish – fast, elegant and utterly deadly, the Succubus carries an agoniser and archite glaive, with a trophy rack giving an appropriately grisly indicator of her prowess, while her riveted armour features a set of cables which burrow into her neck, delivering doses of powerful combat stims- A datacard for Vysa Kharavyxis, featuring her characteristics, weapons, abilities and specialisms, along with a card featuring his background- A card featuring Vysa Kharavyxis’ skill tree – Succubus specialisms which can only be used by that character - 5 Drukhari Commander Tactics Cards, including 2 Tactics exclusive to this set- A sheet of tokens for use in games of Kill Team – this includes 1 Move/Charge token, 1 Fall Back/Advance token, 1 Ready/Shoot token, 6 Tactic/psychic power tokens, 3 wound tokens, and 3 objective tokens. Gitzog Wurldkilla has had enough of his vanguard forces having all the fun. Rumours have circulated back to him that his old mate Krogskull has got ahead of him and is burning stuff before it can be properly looted. Gitzog knows his Waaagh! will lose momentum if all the good scrap sites are on fire, so it’s time to bash some heads together and get everyone back in line. Anyone in his way will be shot, eaten by his squiggy beast Redfangz or cut to chunks by his shearing power klaw.Add a Commander – a powerful hero character with unique abilities and rules – to your Ork kill team with this set. 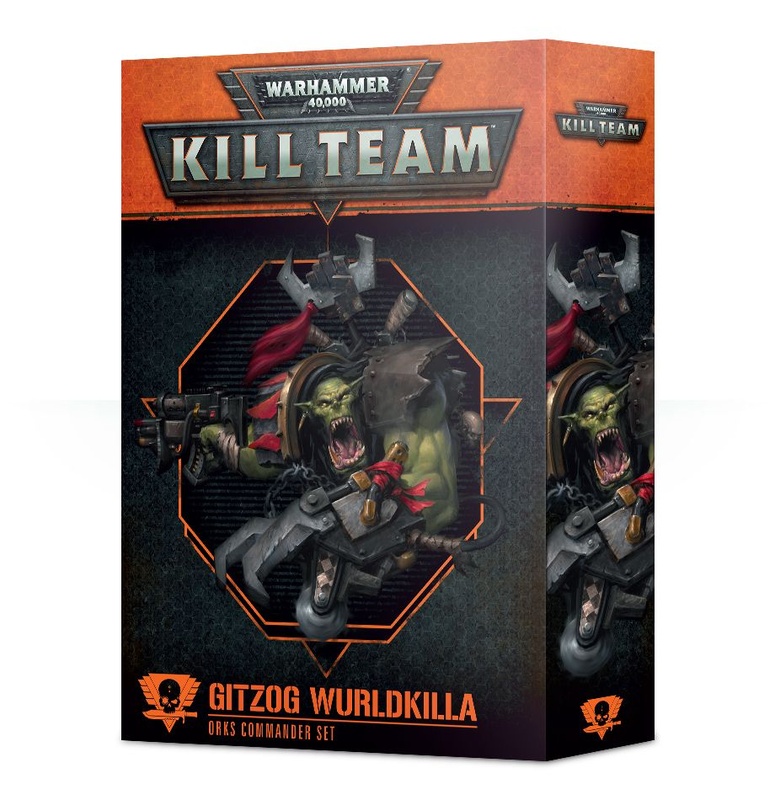 It contains a multipart plastic Warboss miniature, a set of cards packed with exclusive rules and a sheet of tokens for use in-game:- An Ork Warboss: this multipart plastic kit represents Gitzog Wurldkilla – or the Commander of any Ork Kill Team you wish – a tall, muscular and imposing sight even by Ork standards, accompanied by a large, impressively-betoothed squig and clutching a kombi-weapon in one hand, the other replaced entirely by a vicious power klaw.- A datacard for Gitzog Wurldkilla, featuring his characteristics, weapons, abilities and specialisms, along with a card featuring his background- A card featuring Gitzog Wurldkilla’s skill tree – Warboss specialisms which can only be used by that character- 5 Ork Commander Tactics cards, including 2 Tactics exclusive to this set- A sheet of tokens for use in games of Kill Team – this includes 1 Move/Charge token, 1 Fall Back/Advance token, 1 Ready/Shoot token, 6 Tactic/psychic power tokens, 3 wound tokens, and 3 objective tokens. 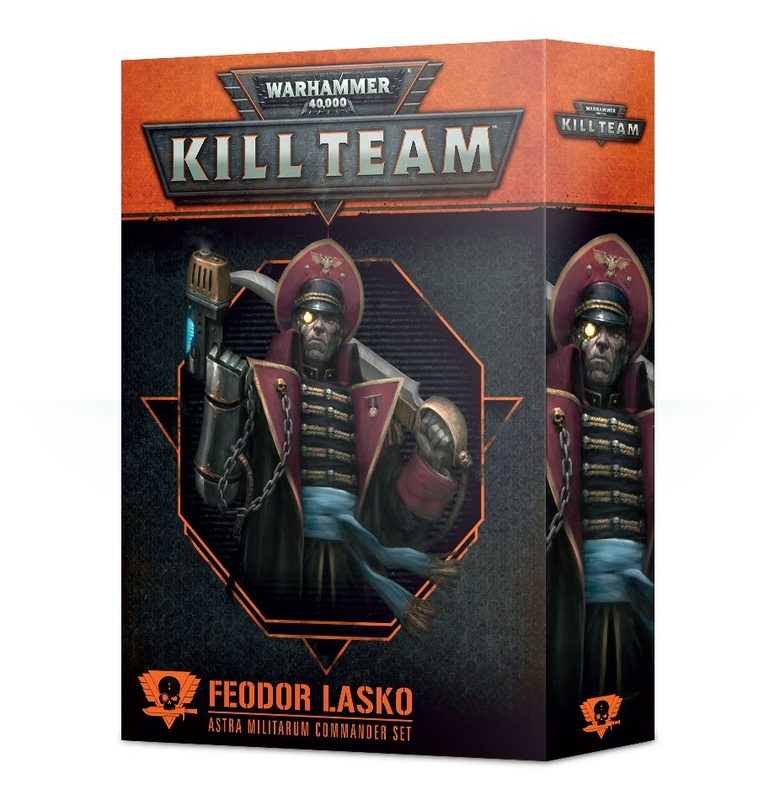 Feodor Lasko is despised by thousands of Astra Militarum in the Vigilus System, for he has a reputation for making callous, spur-of-the-moment executions – his role, however, is as much warrior as disciplinarian. Drop Force Imperator of the 46th Zetetic Tygers have been engaged in a running battle against a monstrous predator – the kind that claimed Lasko’s eye and right arm on the nearby planet of Densa Grande. 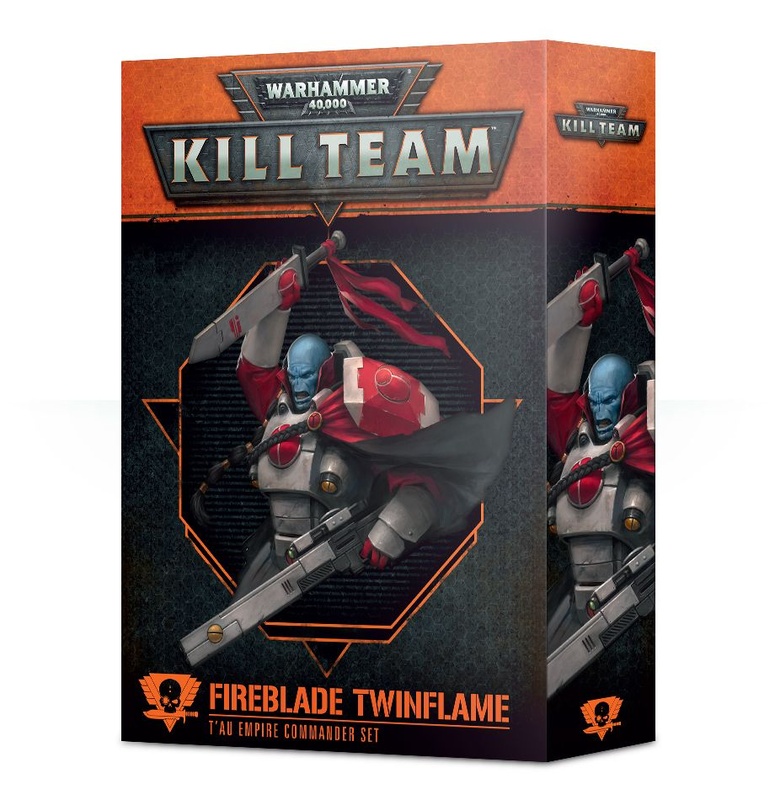 He torched that beast with his plasma pistol and hopes to achieve similar results on Vigilus.Add a Commander – a powerful hero character with unique abilities and rules – to your Astra Militarum kill team with this set. It contains a multipart plastic Officio Prefectus Commissar miniature, a set of cards packed with exclusive rules and a sheet of tokens for use in-game:- An Officio Prefectus Commissar: this multipart plastic kit is used to represent Feodor Lasko – or the Commander of any Astra Militarum kill team you wish – clad in the striking, authoritarian uniform of a Commissar, equipped with either a bolt pistol or plasma pistol at the end of his bionic right arm, his left hand wielding a power sword- A datacard for Feodor Lasko, featuring his characteristics, weapons, abilities and specialisms, along with a card featuring his background- A card featuring Feodor Lasko’s skill tree – Officio Prefectus Commissar specialisms which can only be used by that character- 5 Astra Militarum Commander Tactics Cards, including 2 Tactics exclusive to this set- A sheet of tokens for use in games of Kill Team – this includes 1 Move/Charge token, 1 Fall Back/Advance token, 1 Ready/Shoot token, 6 Tactic/psychic power tokens, 3 wound tokens, and 3 objective tokens. The towering Necron Overlord known as Ankra the Colossus never forgives a slight, and as he possesses a body of immortal metal, has had time enough to repay nearly every insult dealt against him. His current vendetta is against the T’au of Omis Prion, who have foolishly interrupted his search for the laboratories of the Triumvirate of the Crimson Sceptre. Ankra has resolved to settle this matter in person, telling himself it will be more efficient that way – though in truth, it is just as likely he wishes to feel the splash of hot blood upon his metal body once more.Add a Commander – a powerful hero character with unique abilities and rules – to your Necron kill team with this set. It contains a multipart plastic Overlord miniature, a set of cards packed with exclusive rules and a sheet of tokens for use in-game:- An Overlord: this multipart plastic kit is used to represent Ankra the Colossus – or the Commander of any Necron kill team you wish. Posed with the kind of triumphant attitude you can only really get from millennia of slaughter, he wields a voidscythe and resurrection orb.- A datacard for Ankra the Colossus, featuring its characteristics, weapons, abilities and specialisms, along with a card featuring his background- A card featuring Ankra the Colossus’ skill tree – Overlord specialisms which can only be used by that character- 6 Necron Commander Tactics Cards, including 2 Tactics exclusive to this set- A sheet of tokens for use in games of Kill Team – this includes 1 Move/Charge token, 1 Fall Back/Advance token, 1 Ready/Shoot token, 6 Tactic/psychic power tokens, 3 wound tokens, and 3 objective tokens. Some warriors are destined to bear the mantle of command. Whether hardened veterans, inspirational orators or blood-hungry champions, these leaders are worth many times their number, possessing the might and sheer force of will to change the course of battle in an instant. These legendary commanders instil dread in their enemies just as they inspire fierce loyalty in their comrades, tipping the balance of entire war zones and turning impending routs into triumphant victories. 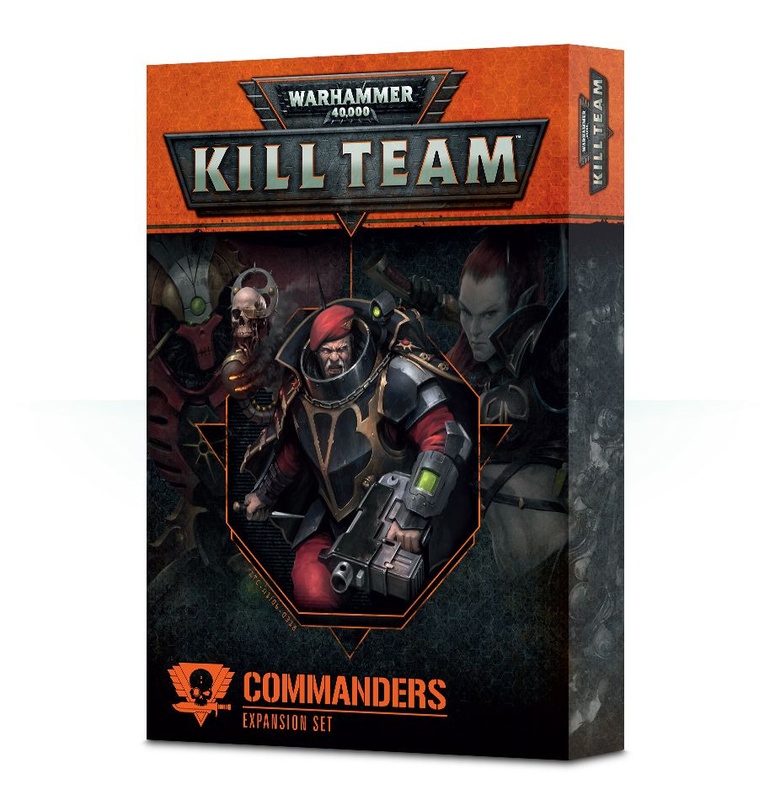 No matter their chosen expertise, all are exemplars of their kind, the embodiment of their Faction’s martial strengths.Kill Team: Commanders is an expansion for Warhammer 40,000: Kill Team, introducing elite war leaders and experts in the art of battle – Commanders. 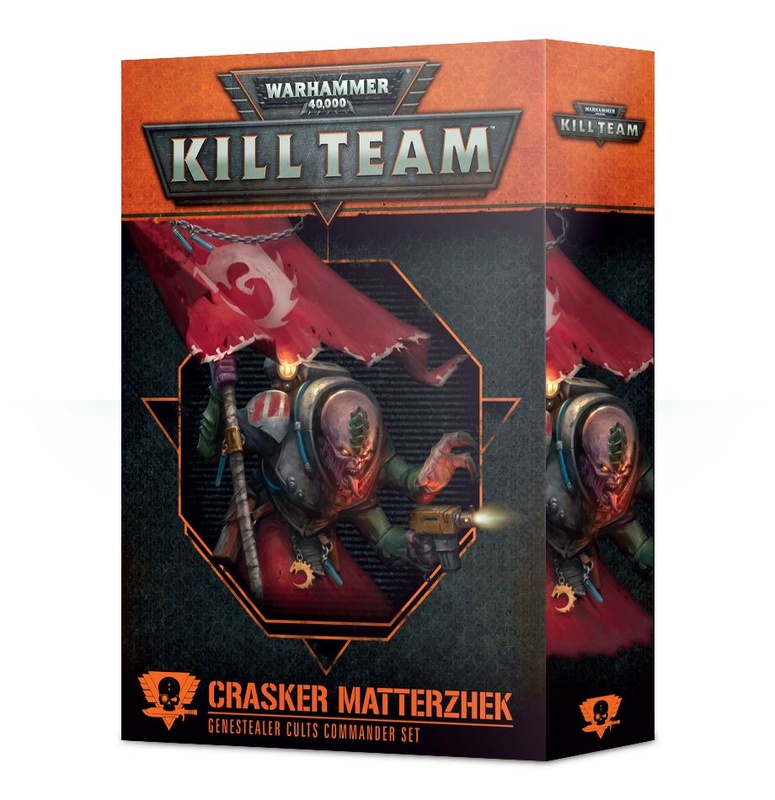 It contains all the rules required to add these powerful hero characters to your Kill Team battles and campaigns at a variety of balanced skill levels and provides missions designed to showcase these miniatures in open, narrative and matched play. Included in the box:The BookA 120-page softback book, Kill Team: Commanders explains everything you need to know about Commanders, their role at the head of a kill team and how to leverage their abilities in your games:- A Galaxy at War: an introduction to the setting of Kill Team in the 41st Millennium, a time of endless conflict, a nightmare in which all hope is forsaken and Humanity stands upon the brink of total damnation – this section explains the role and function of Commanders, the abilities and talents they add to the kill teams under their leadership and the nature of the shadow wars they fight, from all-out firefights on worlds torn apart to surgical strikes on specific targets- Commander Tactics and Traits: these are specific Tactics and Traits for use in games, only applicable to Commanders- Psychic Powers: 6 devastating psychic powers which any Commander psyker can choose from- Rules for fielding Commanders as part of a Kill Team campaign, with a table determining the events that occur should your Commander fall victim to your opponent- Aura Tactics: Commanders are inherently charismatic leaders, and Aura Tactics reflect this – passive abilities which affect models within a certain distance- Specialists: rules for 10 different types of Commander specialisms – Ferocity, Fortitude, Leadership, Logistics, Melee, Psyker, Shooting, Stealth, Strategist and Strength – each featuring its own specific Tactics and skill tree, allowing you to field your Commander according to the play style you prefer; whether that be a psychotic berserker, a studious tactician, or anything in between- A comprehensive list of Commanders available to the 16 Warhammer 40,000 factions covered in Kill Team – Adeptus Astartes, Deathwatch, Grey Knights, Astra Militarum, Adeptus Mechanicus, Heretic Astartes, Death Guard, Thousand Sons, Asuryani, Drukhari, Harlequins, Necrons, Orks, T’au Empire, Tyranids, and Genestealer Cults – featuring background information, datasheets, Tactics and psychic disciplines along with the relevant points values and wargear available to each- Additional rules covering deployment and battle length- Heroic Regalia: this section presents a collection of beautifully-painted Citadel miniatures, demonstrating the formidable sight of Kill Team Commanders in full flow on the battlefield- Missions: 6 narrative play missions, 6 matched play missions and 3 open play missions for Kill Team with Commanders, along with a host of inspirational ideas for your own open play games. Each of these missions includes guidance on battlefield setup, the scouting phase, deployment, battle length and victory conditions, with the matched play missions featuring alternate deployment maps allowing up to 4 kill teams to duke it out;- A Campaign Record sheet for you to photocopy and use to keep track of the missions you play and their results.ExtrasAlong with the comprehensive book of rules, there is included a set of cards and tokens for use with Commanders:- 33 Universal Commander Tactics cards, acting as a handy reference for the Specialist Tactics from the book- 7 cards covering the psychic powers from the book, along with Psybolt from the Kill Team Core Manual- 20 blank Commander datacards, featuring space in which to record the name, characteristics, weapons, abilities, specialisms, demeanours, levels and injuries of your Commanders- A double-sided Commander token sheet, containing a move/charge token, a fall back/advance token, a ready/shoot token, 6 Aura Tactic/Psychic Power tokens, 3 wound tokens, and 3 objective tokens.A copy of the Kill Team Core Manual is required to use this set. On apocalyptic war worlds and amidst savagely contested galactic strongholds, miles-long trench lines stretch to the horizon studded with bunkers, weapons batteries and redoubts. 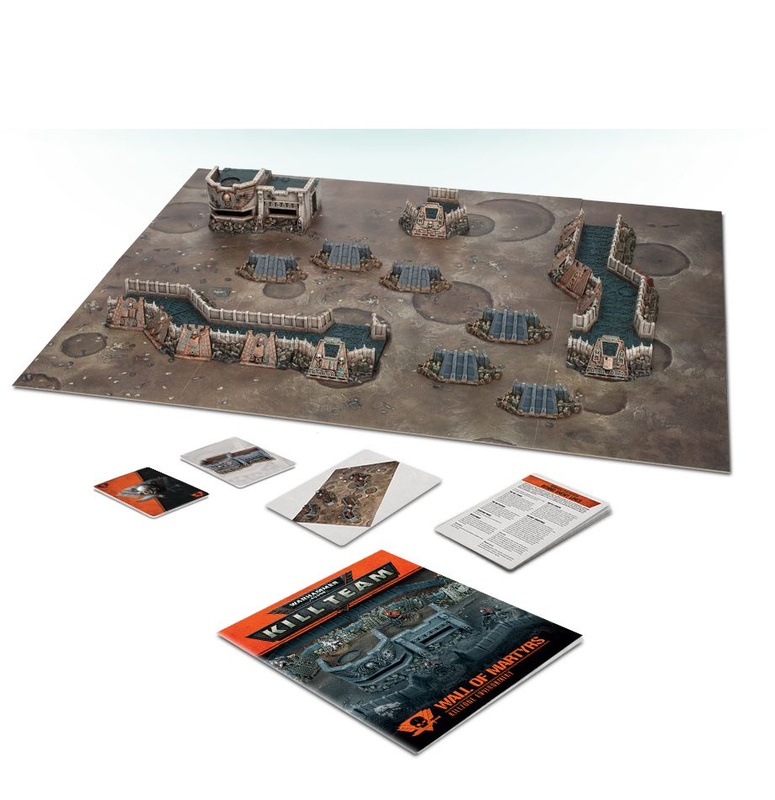 Mighty bulwarks of stone and steel loom forth from the shattered earth, resisting the onslaught of foes and providing shelter for those who know only war.The Wall of Martyrs Killzone Environment is an expansion for Kill Team – in the packed box, you’ll find a gameboard, scenery, and exclusive rules that use the unique nature of the Wall of Martyrs terrain to introduce dangerous new missions and powerful effects to your games. Included:- A double-sided Kill Team gameboard measuring 22” x 30”, printed on heavy, durable card stock. 1 side depicts an urban environment with a street bisecting sets of ruins, and the other an open plain pock-marked by craters;- An 8-page booklet containing descriptions of the trenches and fortifications used across the Imperium to hold back aggressors, the manner in which kill teams use these networks of defences to their advantage, and an example of a Wall of martyrs environment built from the scenery included in the box;- 12 Wall of Martyrs Tactics cards – these can be used by any Kill Team faction, with 7 cards providing interactions with the Wall of Martyrs scenery and 5 being used specifically by Scout, Comms, Veteran or Leader Specialists;- A Wall of Martyrs Environment card, which provides 6 different rules allowing interaction – positive and negative – with the scenery;- 4 Wall of Martyrs Mission cards – designed to be used in conjunction with the gameboard and scenery, this is a set of 2 Matched Play missions and 2 Narrative Play missions, which are split between attacker and defender;- An Imperial Bunker, a set of 2 Imperial Defence Lines and an Imperial Defence Placement – these miniatures are supplied on dark grey plastic. Nemesor Ankra of the Novokh Dynasty never forgives a slight. Over the aeons the Necron Overlord has ordered the deaths of countless foes who have dared to insult him or stand in the path of his conquering armies. 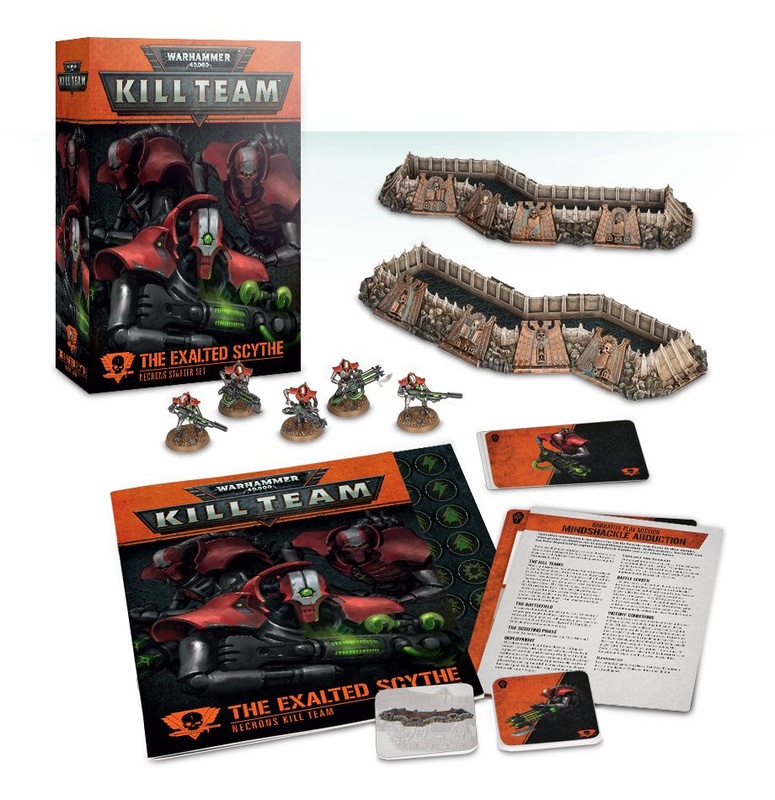 It falls to the feared executioners known as the Exalted Scythe to carry out the Nemesor’s will.An expansion for Warhammer 40,000: Kill Team, this box includes 5 plastic miniatures, a scenery set (with exclusive rules! ), and brand-new Tactics and Mission cards. Included:- A 5-model set of Immortals – these can be built instead as Deathmarks, depending on your preference. Included are the synaptic disintegrators, gauss blasters and tesla carbines needed to build either team, all supplied on green-coloured plastic;- A scenery set – the Wall of Martyrs Imperial Defence Line – supplied on dark grey-coloured plastic;- 11 Tactics cards and 2 Mission cards: the Tactics cards are split between the 4 Necrons Tactics taken from the Kill Team Core Manual and 6 Necrons Tactics exclusive to this set, giving you new ways to play with your Necrons kill team. Also included is a Tactics card for the included scenery, providing rules for incorporating this into your games. The 2 Mission cards are split between 1 Matched Play and 1 Narrative Play mission;- An 8-page booklet describing the Exalted Scythe, their history and background, along with a showcase of painted miniatures and a timeline of their deployments;- 5 datacards for The Exalted Scythe, ready for you to use right away;- A sheet of card gaming tokens, including 10 Move/Charge tokens, 10 Fall Back/Advance tokens, 10 Shaken tokens, 10 Ready/Shoot tokens, and 6 Objective tokens. The armies of Vior’la Sept are always at the forefront of the T’au’s wars of expansion, overwhelming enemies of the Greater Good with blistering fusillades of pulse fire. 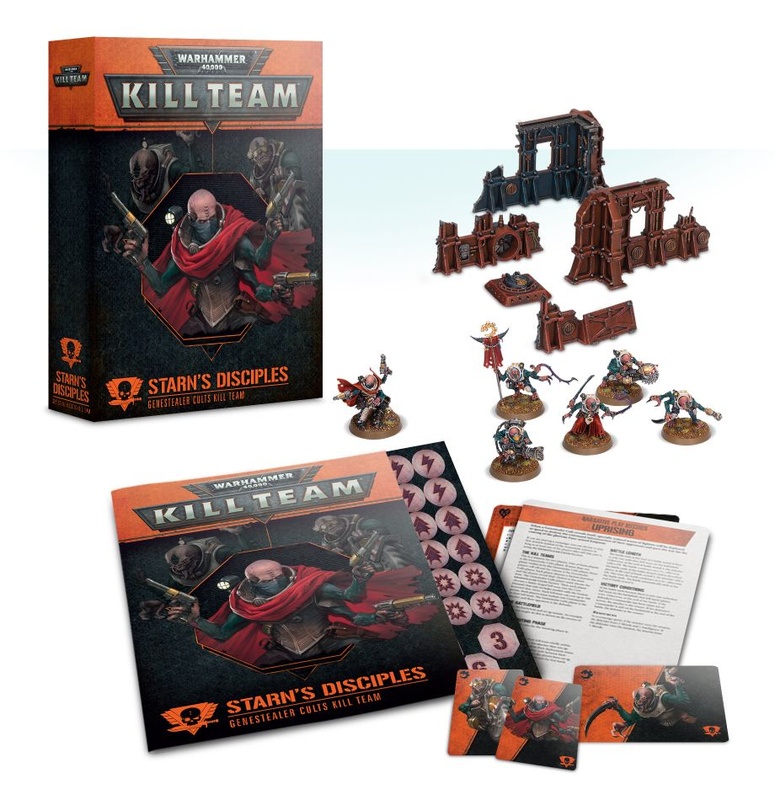 Advance Team Starpulse is comprised of veterans from these bloody campaigns, bonded by hardship and sacrifice.An expansion for Warhammer 40,000: Kill Team, this box includes 12 plastic miniatures, a scenery set (with exclusive rules! ), and brand-new Tactics and Mission cards. Included:- A 10-man set of Fire Warriors – these can be built as a Strike Team or Breacher Team depending on your preference. Included are the pulse pistols, pulse carbines, pulse shotguns, EMP and photon grenades needed to build either team, with options to upgrade 1 to a Shas’ui. Also included are 2 drones and a DS8 Tactical Support Turret, all supplied on khaki-coloured plastic;- A scenery set – the Wall of Martyrs Imperial Defence Line – supplied on dark grey-coloured plastic;- 11 Tactics cards and 2 Mission cards: the Tactics cards are split between the 4 T’au Empire Tactics taken from the Kill Team Core Manual and 6 T’au Empire Tactics exclusive to this set, giving you new ways to play with your T’au Empire kill team. Also included is a Tactics card for the included scenery, providing rules for incorporating this into your games. The 2 Mission cards are split between 1 Matched Play and 1 Narrative Play mission;- An 8-page booklet describing Advance Team Starpulse, their history and background, along with a showcase of painted miniatures and a timeline of their deployments;- 12 datacards for Advance Team Starpulse, ready for you to use right away;- A sheet of card gaming tokens, including 10 Move/Charge tokens, 10 Fall Back/Advance tokens, 10 Shaken tokens, 10 Ready/Shoot tokens, and 6 Objective tokens.